You may think of propane simply as fuel for your barbecue grill – and if you do, you’re missing out on one of the most versatile ways to power your Connecticut home. Power just about any appliance – Propane is one of the most efficient fuel options available for most home comfort appliances, including your cooking range, clothes dryer, pool or patio heater, and much more. Heat your home – Today’s propane furnaces can operate at up to 99 percent efficiency, providing warm air and performance that no heat pump can match. Provide unlimited hot water – Replace the giant water heater in your basement with a suitcase-sized, high-efficiency tankless propane water heater and you’ll get virtually unlimited hot water (no more cold showers!) at a much lower cost per gallon than an electric heater. Reclaim a lost room – Most of us have a room that we don’t use (or use less) in the winter because it’s just too darn cold or drafty. With a powerful propane space heater, you can turn cold storage into a living room. Add a centerpiece to your living room or outdoor space – An indoor or outdoor propane hearth will quickly transform any space into the center of attention in your home, providing the warm glow of a fire at the flick of a switch. Give you peace of mind – Severe weather is becoming more common these days, and with it comes inconvenient or even dangerous power outages. With a propane-powered emergency backup generator, you’ll not only keep the lights and heat or A/C on – you’ll also keep your food fresh, your sump pump working and your home security system protecting your valuables. 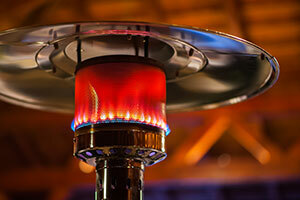 Want another great propane benefit? You can power all of your appliances from a single, durable aboveground or underground propane tank that we can install and maintain for you. What can propane do for you? Contact Hocon Gas today and find out!